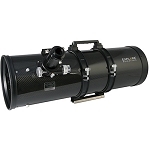 Designed for enhanced astrophotography and imaging performance, the Bresser 8" f/3.9 Reflector Telescope has a shortened focal length versus conventional scopes with a similar aperture to produce a fast f/3.9 focal ratio - translating to shorter exposure times. 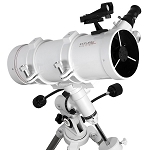 The optical tube assembly (OTA) is offered here without a mount or tripod for users that already have an observational platform. 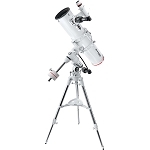 Its large 8" primary mirror allows planets and the Moon to appear bright and clear while having the capacity to see out of the solar system to observe and image nebulae, galaxies, and binary stars. While there is no mount included, a mounting cradle-ring assembly is provided. It clamps over the optical tube and lets the user adjust the orientation and position of the scope relative to the mount to optimize viewing comfort and balancing, while avoiding interference with other equipment. A stainless steel Vixen-style dovetail plate makes it compatible with any alt-az or equatorial mount with a Vixen-style saddle. 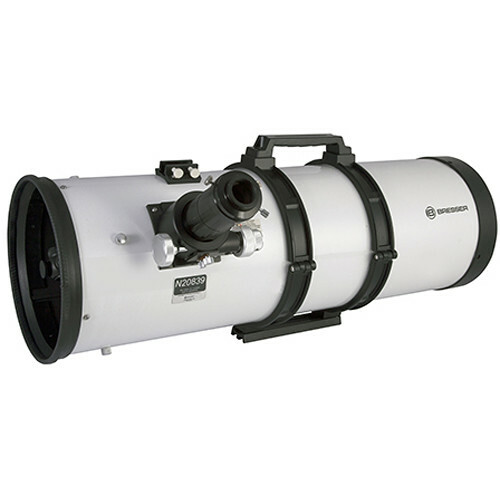 The scope is equipped with a 2" focuser for over-sized eyepieces and accessories, and comes with a 1.25" reducer adapter to use smaller and more popular eyepieces. The focuser is a Crayford-style, instead of the more common rack-and-pinion, which uses a steel rod held tightly against the drawtube to provide a toothless friction system that eliminates backlash and enables ultra-fine precision focusing with its 10:1 reduction micro-focusing knob. Box Dimensions (LxWxH) 36.0 x 16.0 x 16.0"